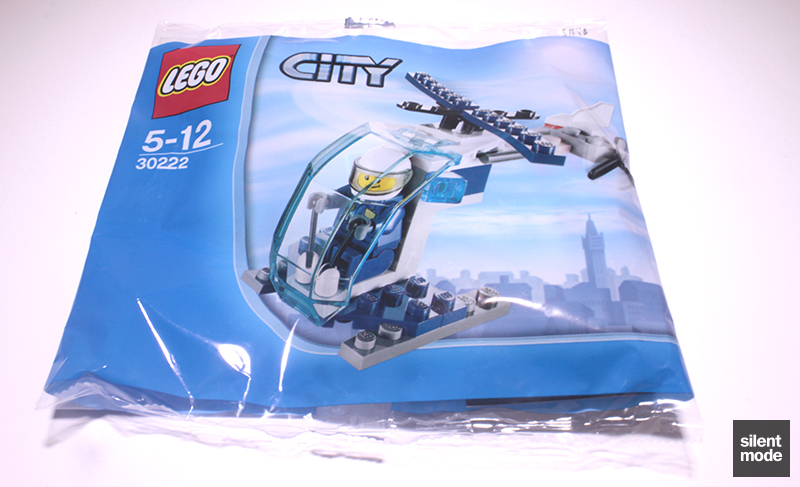 * This was given away with a minimum spend of GBP 25 at LEGO stores or on Shop @ LEGO, during February 2013. Welcome to another review, and this is going to be a very quick one – because it’s another polybag. I managed to get hold of this set during the last AFOL shopping hour (last week), and thought I might as well give the once-over. From the outset we’re dealing with yet another one of those dinky vehicles that LEGO likes to put out for each theme. I remember back in the day, when these sets used to come in tiny boxes and had far fewer pieces (but still included a minifigure). Straight to the point! One very noticeable thing is how plain the packaging looks, which shows just how little there is in this big bag. Even the background, which often “bulks out” the pictured set, is having problems making this helicopter look more substantial than it is. Not much to look at from the back, except for an advertisement for the LEGO Club. Another noticeable thing about this set, looking at all the parts included in it, is that it contains a number of big parts: most obviously the otherwise useless bracket piece in Light Bluish Grey, and the new windscreen part for 2013, which also appears in two other City sets. You may be pleased to find a small handful of Dark Blue parts, with the most useful being the 1×6 plates. 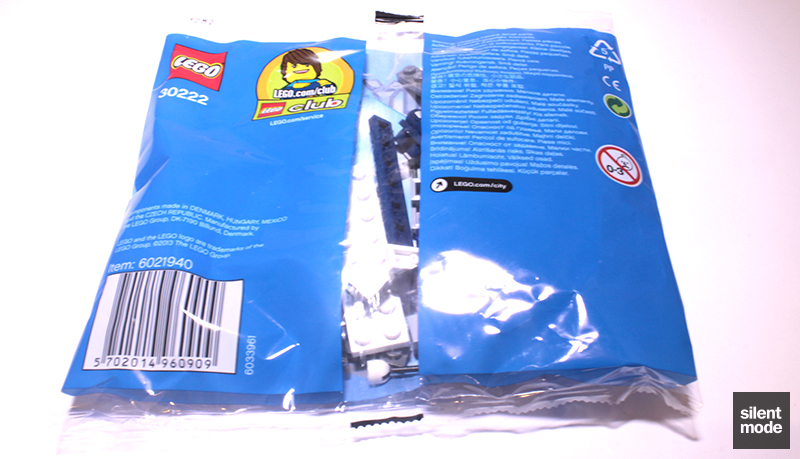 The minifigure has the same outfit as last year’s microlight polybag, and also appears in the same City sets as the windscreen. Blink and you’ll miss it, although this will take a little longer than usual because of the combination of small and large parts. 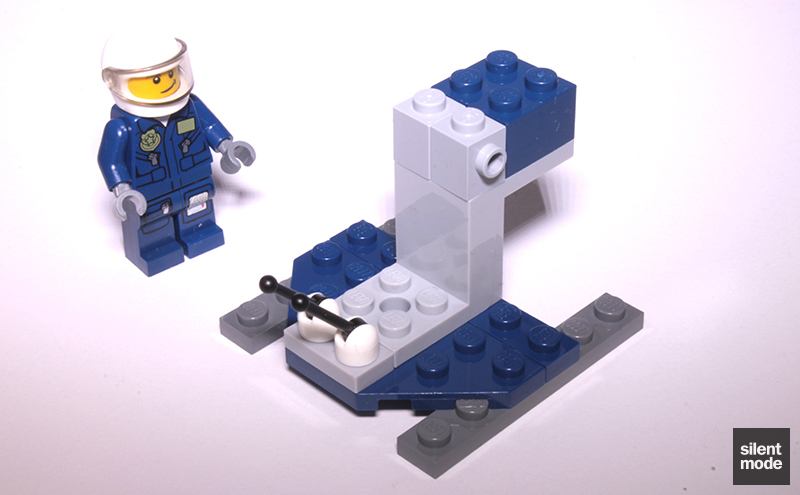 As with other polybag builds there are eight relatively simple steps. The helicopter begins life as this very basic base, using the Dark Blue wedge plate. It may be helpful to use the 1×6 Dark Blue plate as a reference. 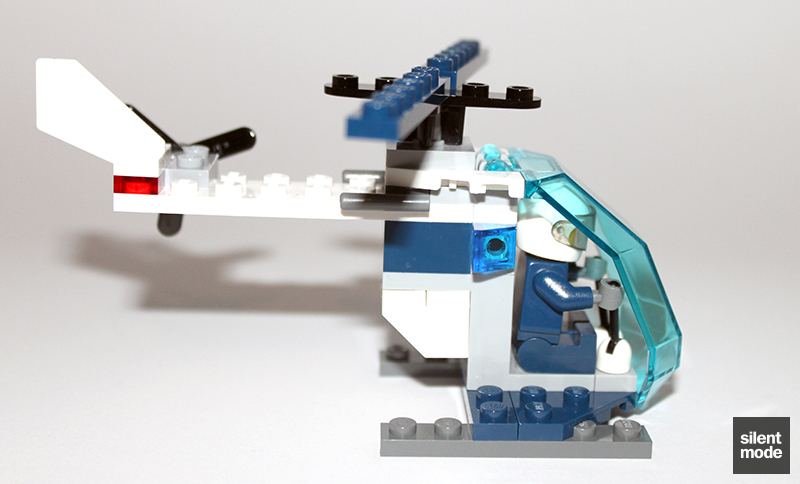 That otherwise useless bracket piece is put to good use, as it forms both the seat and the tail of the helicopter. A blast from the past occurs as we are using White-based levers for the controls. 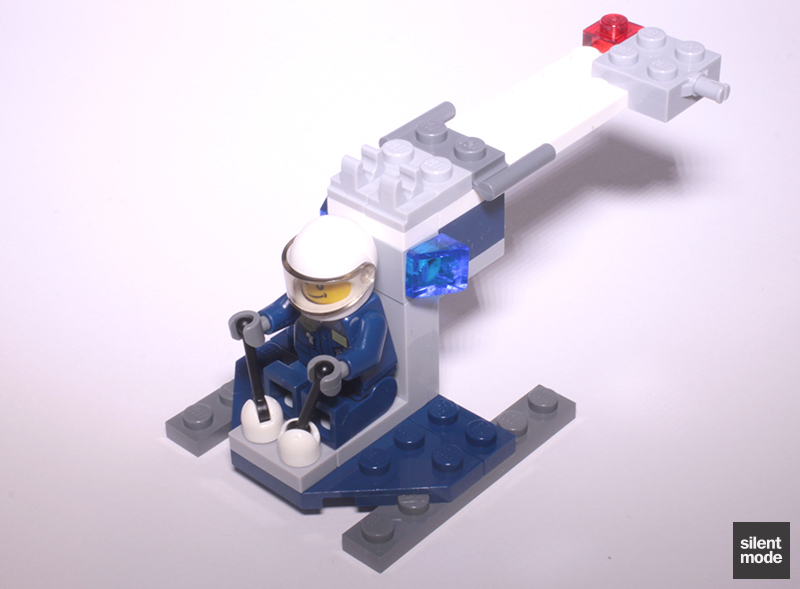 I remember some of the older smaller sets that used levers for the controls, and the frustration involved with trying to make the minifigures hold them properly while driving the vehicle. It’s probably one reason why, for the most part, more recent vehicles use steering wheels or other controls instead. You might want to hang on to that spare lever, however. When adding the minifigure shot and having it hold the levers, I found they didn’t grip very well on the plate. They came off very easily when I had to do the inevitable rotation to make them fit. I do seem to recall this wasn’t as big an issue in previous instances. 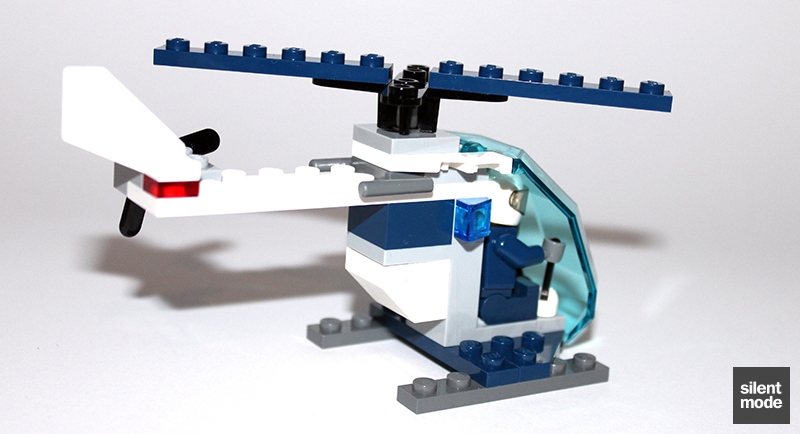 Put everything together and you’ll get this inexpensive, boxy-looking police helicopter. The new windscreen part benefits from having a smooth hinge that’s quite easy to attach, and fits nicely at the front of the helicopter: it lines up against the front-most plates, without touching the minifigure. It was fairly obvious from the beginning what the spare parts would be, but in this case that spare lever may come in useful – particularly if you’re intending to give this to a kid. One of the first things I wondered about this helicopter was how “swooshable” it was. Every vehicle I end up getting hold of is put through a rigorous “swooshability” test (which could be a gimmick to employ in my reviews): the more “swooshable” the vehicle is, the more I like it. A couple of things contributed to this helicopter – as it is – not being very swooshable at all. 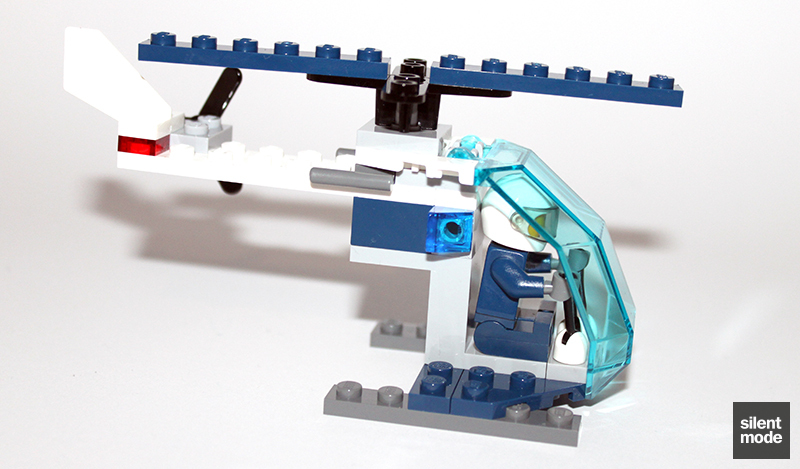 The base of the helicopter is very flat, being comprised of plates: usually helicopters would have those dedicated helicopter “feet”, and although they would have been far too big for this one, I do think something similar – maybe using a couple of extra parts – would have improved the appearance. The flat “feet” may look like just an aesthetic issue, but it makes taking off and landing more awkward. The other thing involved the body of the helicopter itself, which just looks way too thin for something that actually flies. I’m no expert on helicopters by any stretch, but it felt like a huge chunk of the body is missing. The end result, along with its boxy appearance, looks more like an RC helicopter that could be taken out with a BB gun – if it wasn’t for the robust-looking windscreen. But enough ‘dissing the appearance of this helicopter. Obviously this was meant as a cheap and cheerful model, and there are plenty of other versions one can get hold of and make. 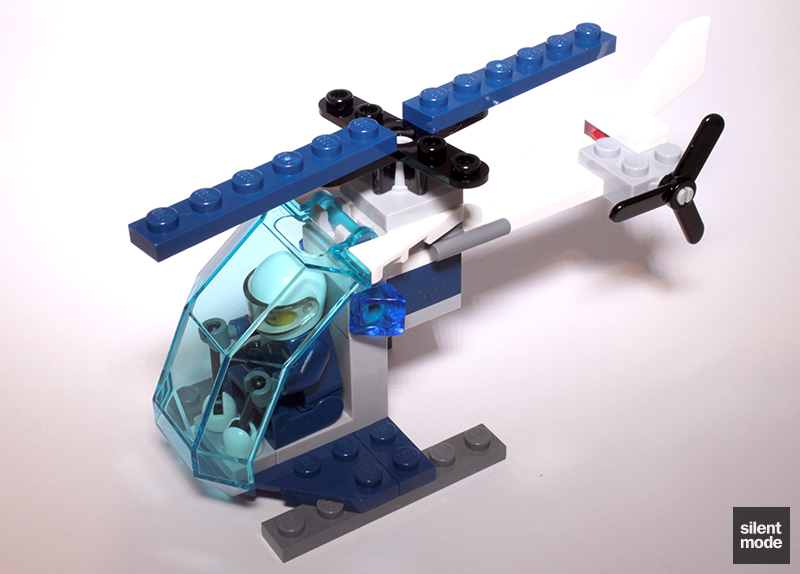 As a cheap and cheerful helicopter it does the job, and as a parts pack it provides a decent amount of Dark Blue parts, as well as those ever-useful SNOT bricks. We also have that relatively new Dark Blue jumpsuit, which could be a standard uniform for police pilots and/or drivers. The one thing that lets the minifigure down is the ‘side-grin’ head: I like it as much as the Friends kitten from Olivia’s Tree House. Virtually anything would have been better than that choice of head… although it’s nothing some Brasso wouldn’t fix. Once again there’s no definitive price for this set, so it’s time for another score out of thin air. I’m going to give this one a 4.0/10, as while I don’t mind this being a free giveaway, I would rather spend the money on Ewar’s Acro Fighter. The first thing I did after taking these photos was add some “body” to the helicopter, by attaching two 1×2 plates (you could use a 2×2 plate) and a 2×2 inverted slope to the underside of the bracket. Although the helicopter still looks boxy, it gave the impression it could fly higher than 30 feet above ground, and made it much more “swooshable”. It is an extra two parts added to the build, and for what it’s worth the designers did a good job using only 33 parts.